In SAS CRW tactical gear, Normex coverall provides frame resistance to the whole body. It is a basic tactical gear for every CRW assaulter from 80’s till today. 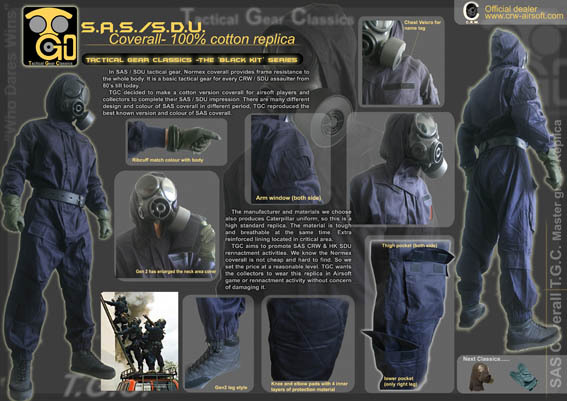 TGC decided to make a cotton version coverall for airsoft players and collectors to complete their SAS impression. 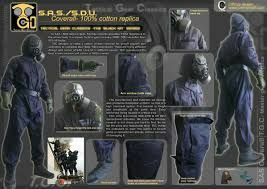 There are many different design and colour of SAS coverall in several period, TGC reproduced the best known version and colour of SAS coverall. The manufacturer and materials we choose also produces Caterpillar uniform, so this is a high standard replica. The material is tough and breathable at the same time. Extra reinforced lining located in critical area. TGC aims to promote SAS CRW reenactment activities. We know the Normex coverall is not cheap and hard to find. So we set the price at a reasonable level. TGC wants the collectors to wear this replica in Airsoft game or reenactment activity without concern of damaging it.